This layout is for the Walk Down Memory Lane design team blog sketch challenge (that's a mouthful!). I pretty much followed the sketch exactly. I cut the petals out freehand and then stitched around the edges. The patterned paper is from My Mind's Eye. The darkest cardstock is KI Memories, the medium pink cardstock is Bazzill and the lightest cardstock (journaling strips) is Stampin Up. The flower center is a die cut shape from My Mind's Eye (it was all one set of paper and elements). The letters and number are cut from the Plantin Schoolbook cricut cartridge. I cut the number 1 from thin chipboard using my new deep cut blade. The scallops are just circles that are partly under the strip of patterned paper. Click on the picture to see it bigger but be warned, it is pretty big (about 150 kb). 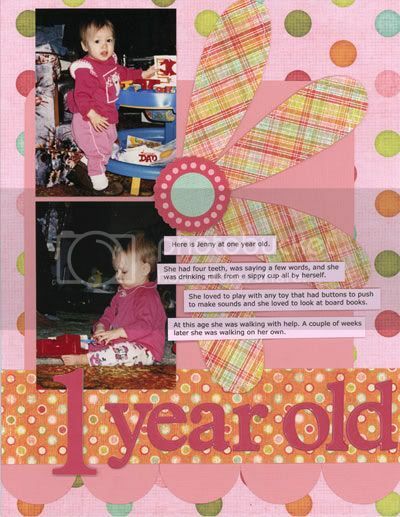 What a pretty layout,Love all the layers and the colors are just great, but the pictures are so so darling!!! I LOVE your layout!!! I may have to scraplift this if you don't mind! It is wonderful!!! Love the layout! The colors are FAB! You are inspring me to finish my 4 yr olds 1 year album, and to begin my 2 year olds first page! This is really sweet. I like how you stitched around the flower petals. Great page and layout. I love the colors and the pictures are so cute. What a sweetie. This is so cute, love the big flower! Pretty colors! So are you trying out for the DT? If so good luck to you! The flower is just beautiful. Oh, I love this layout! Great colors and the journaling strips are really neat! Awesome page!! Love the layout and the colors. I really like the petals that you stitched on. Great layout and love the stitching detail! Oh my gosh that Apple Crisp with Cheese sounds yummy!!! I am going to have to try this recipe, thanks for [osting it. What a pretty pretty scrapbook page. Love the colors and layout. This is the cutest page ever! The bright colors are perfect and right up my alley! Blog candy has been delivered!